Submitted by dougj on Wed, 2005-10-19 14:24. 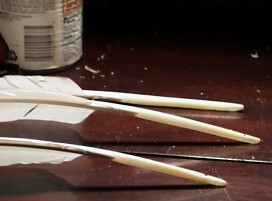 Via BoingBoing is a link to a great page on making yourself a quill pen. Submitted by Nels Tomlinson (not verified) on Sat, 2005-11-26 09:08. That's a neat site. I've shown my kids how to make quill pens, but without the tempering, they weren't very satisfactory. I'll have to try it again, with tempering, next time the ravens are moulting. Another way to make a quill pen is to cut the very tip off, to make a hole slightly larger than the skinny ballpoint refills. Jam a skinny ballpoint refill in there, and finish it up with a dab of glue. It's cheating, but it works well. You can write with a feather for taking notes in class, or where ever you want to get people's attention. Submitted by Day Owl (not verified) on Sat, 2005-11-26 14:04. Slightly OT, but amusing, I hope. When this post first appeared, I sent the quill pen link to my son, who shares with me an abiding interest in making things by hand. The more obscure or antiquated the craft, the happier we are. About 10 minutes after I sent him the quill pen link, back came the reply: a link to instructions for chipping stone knives. Submitted by neoluddite on Wed, 2008-10-29 13:03. I wonder where they get the feathers? I hope they don't kill birds just for feathers. Submitted by ygor on Wed, 2008-10-29 18:15. You can usually find loose feathers that the birds shed/molt. However, if one is planning to eat the bird anyway, why not make use of as much of it as possible ? I once arranged with some goose hunters to get the nice, big wing primaries from the guy who prepares the geese for cooking. Submitted by Lex on Thu, 2008-10-30 05:37. Submitted by ygor on Thu, 2008-10-30 05:40.